A rarely used tool by some builders, as we have seen by reading some of the goodies on the on the RV email groups. Be ready to ask for help from other builders and to learn how to think outside the box. I bought this 30 gallon compressor without checking the RV email groups first. D'oh! The motor and compressor are one unit and do not require oil. A 30 gallon compressor can handle just about anything your want to do. BUT, this sucker is incredibly loud and get's overheated easily. This is the compressor that I should have bought. The motor requires oil to be added to it occasionally and drives the compressor unit with a belt. I'ts much quieter and lasts longer than the non-oiled compressor. The cost is about the same as well. I'll get one when I build my next RV. Since I am using the "non-oiled" compressor, I decided to create a sound proof box to control the noise it makes. I found this drawing on the Internet. I lined the inside of my sound box with a foam rubber mattress cover that I got from Target. My neighbors say that they can't hear the compressor at all. The rivet gun is another story however. You'll drive yourself nuts changing your air driven tools out and resetting pressures. This setup allows you to have a air hose for drilling, one for painting and one for riveting, without having to do much else. I got this reversible pneumatic drill at Amazon and it works fine. Electric drills just don't get the high RPMs that need for working with metal. These #40 drill bits are used the most. Get a bunch. These #30 drill bits are used the most as well. Get a bunch. #21 drill bits aren't used that much, but you'll still need a few. Same here. #12 drill bits aren't used that much, but you'll still need a few. I have some #30 and #40 12 inch drill bits (3 of each). These long (flexible) drill bits come in handy when your drill gets in the way or you need to drill "around the corner". I ordered this 3X Rivet Gun from Aircraft Spruce. I have heard that some builders ordered a 2X Rivet Gun (which doesn't hit as hard as the 3X) and then had to order the 3X Rivet Gun to get the punch they needed for the larger rivets. These are main bucking bars I use, especially the one on the left. I got them from Aicraft Tool Company. I cut the one on the right in half to use on the trim tab spar and a lot of other tight places. The scotchbrite wheel does a good job on smoothing the edges and faces of any prospective bucking bar. This bucking bar was made especially for back riveting skins. You can get it at Cleveland Aircraft Tools. If the page doesn't come up, just press the Refresh button on your browser to see the page. I know I could have built the whole aircraft with a hand squeezer, but this dude makes life much easier and does better job of squeezing rivets than I do. I got this bench grinder from Lowes (aircraft and lumber supply). I mounted my scotchbrite wheel on one side and removed the other wheel from the other side. It makes it easier to deburr the aluminum with the other wheel out of the way. The Scotchbrite wheel comes handy when "breaking" the edges of the various aluminum parts, are which quite sharp. Usually one swipe of part edge over the wheel smoothes it down quite nicely. Gotta' have this one! Cutting aluminum parts is big part of building the RV. I put an 18 TPI metal cutting bansaw blade on it (18 teeth per inch). This LONG back rivet set was designed for the RV-10 but works great for rivets that are difficult to get to. I used it when riveting on the first wing skins, but wasn't as happy with the outcome as I was by using the old fashion mushroom head on the rivet gun with a bucking bar from behind on the second wing. I think I got it at Avery Tools. Most times the flanges on the ribs are not at a perfect 90 degree angle, so you will need these puppies to straighten everthing up. They ain't cheap! 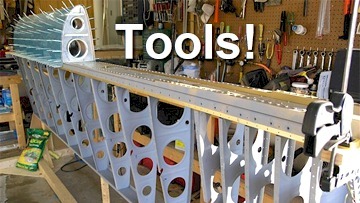 You can get from an aircraft tool dealer, but Home Depot has the same for LOT cheaper. These little dudes are expensive, butcha' gotta have em'. The ones shown here are a 3/32", 1/8", 5/32"and 3/16" Squeezer Set; a 1/2" and 3/8" Flush Squeezers; and 3/32", 1/8", 5/32" and 3/16" Dimple Dies. If you're just starting out on a tail kit, you only need the 3/32" and 1/8" sets. Check Van's Required Tools page for a complete list. When it comes time to dimpling the flanges on most ribs, the regular dimple die is too wide and actually bends the flange on the rib, pushing out away from the web of the rib. This special dimple die solves that problem. Almost all aircraft tool dealers carry them. I have a 3/32" and a 1/8". These dimple dies make a dimple that is a little deeper than a normal dimple die that supposedly makes the seal around the fuel tank rivets a little tighter. Some builders use them, some don't. I used them because someone else told me to. "OK, I with you fellers". These dimple dies are handy in tight places where you can't get a regular set of dimple dies to fit in a tight situation. I also use them to staighten out "bad" dimples that are sometimes made by the "C" Frame dimple whacker. Clecos "bring it all together", holding parts tightly against each while you're getting ready to rivet. These four clecos sizes are used the most on the RV as shown in the picture. They are the 3/16" cleco (Brass color - for a #10 drill bit hole), the 3/32" cleco (Silver or Cadmium color - for a #40 drill bit hole), 5/32" (Black color - for a #20 drill bit hole) and the 1/8" (Copper color - for a #30 drill bit hole). I have about 1,000 silver (3/32") clecos so far, about 200 copper (1/8") clecos, and a dozen or more of the brass (3/16") and black (5/32") clecos. Cleco pliers are used to place and remove the spring loaded cleco fasteners and clamps. I have three pair. One at the hangar and two in the garage (the other hangar), just in case my son wants to help. There are pneumatic cleco pliers available for those who don't want the hand exercise. I used these pads on places where the instructions call for me to "rough up" a surface to allow for fuel tank sealant adhesion. These sponge sandpaper products work great at rounding off the edges of the aluminum where you can't use the Scotchbrite wheel, especially inside the lightening holes in the ribs. I also use regular 320-400 grit wet/dry sandpaper to finish off the edges that are "broken"(roughly rounded) by the Scotchbrite wheel. The pink sponge in the picture is an ultra thin sandpaper sponge that allows me to get between the rib flanges on the corners. These guys come in handy when your checking to see if your rivet is set properly. There are 4 gauges in the set, one for each rivet size typically used to build an RV. There are two terms you will need to know. One is "manufactured head" which the factory made head of the rivet, and the "shop head", which is made by you, the builder. The hole of the gauge is placed over the shop head of the rivet (the part you just flattened). If the shop head goes up into gauge hole, you didn't flatten the rivet enough, try again. The notch cutout on the other end of the gauge checks to see if you flattened the rivet too much. If the notch can go over the flattened shop head of the rivet without touching it, you flattened it too much and the rivet will need to be drilled out and a new one installed. If the notch hits the shop head and won't go over it, you're good to go. All you need to do to make sure your rivets are just right, is to satisfy the requirements of each end of the gauge for that particular rivet size. After you have more experience with riveting, you will be able to just look at the rivet and know whether is is acceptable or not.